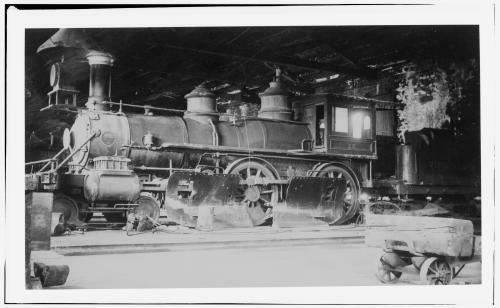 This is V&T Engine #12, the "Genoa", sitting in the enginehouse in August, 1938. You may not be able to tell from the picture, but at this point the engine had been mothballed for 30 years. The engine was retired in 1908 when service levels had declined and it was no longer needed. The next year, 1939, the Genoa was sold and put on display at the New York World's Fair. Today it sits in the great hall at the California State Railroad Museum.